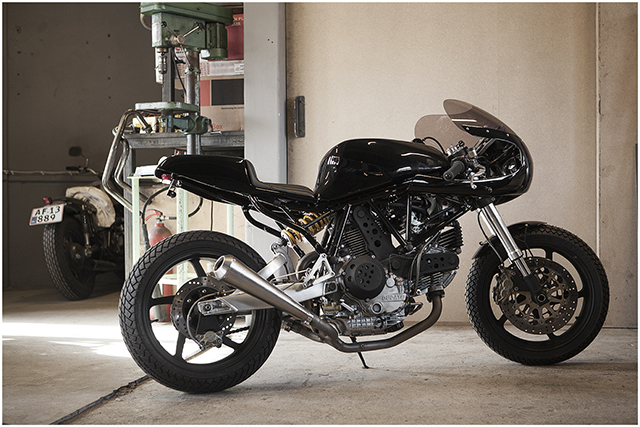 In many ways the Ducati mid-level sportsbikes of the 1990’s make the perfect base for a custom build. Quality suspension and brake components, the brilliantly torquey L-twin engine and Ducati prestige make the bare bones very appealing. But dressed up with gordy plastics of the era and with power figures dwarfed by modern sportsbikes they are often overlooked. But now being reasonably priced in the second hand market builders like WM are making use of the good and throwing away the bad. 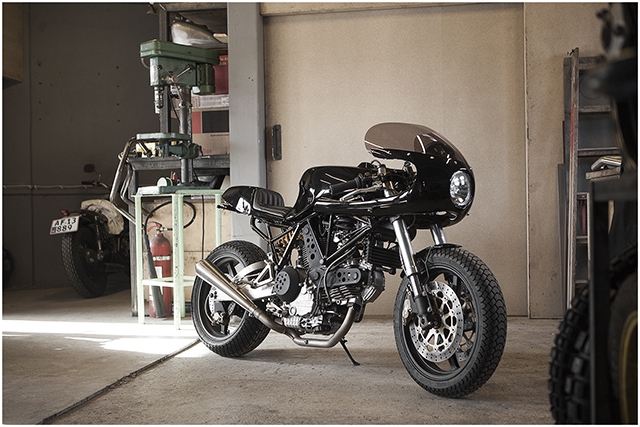 And the 900ss features the brilliant air cooled L-twin that is classic Ducati, sure the peak power figure isn’t huge, but the torque in mid-range is exactly what a Café bike should be about. Fitted with K&N pod filters and WM’s own off the shelf ‘Stainless Classic Mufflers’ it’s got the bark to match the bite! There is no denying the beauty and simplicity of a Ducati tubular trellis frame, but the subframe fitted to the 1990’s models is truly a mess and with the plastics removed there is simply no way to make it look good. So WM heavily modified it to leave only the absolutely necessary amount of metal and resigned the rest to the scrap bin. The front Showa upside-down fully adjustable forks have been retained, although they are now 40mm lower. While the satisfactory Showa rear shock has been ditched from the standard swing arm in favour of a truly amazing adjustable Öhlins unit. The original body work has not aged well on 80’s and 90’s Ducati sportsbikes in the eyes of the majority, a problem not even legendary designer Pierre Terblanche could rectify. So WM simply tossed them aside in favour of their own designs. 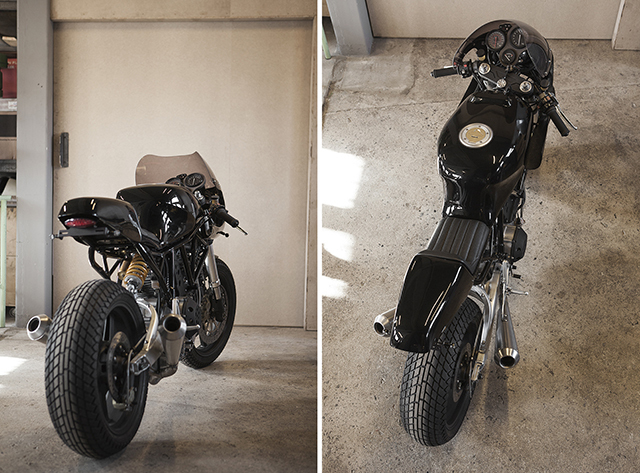 Chasing the look of the SS bikes of the 70’s a replica front fairing now adorns the build. 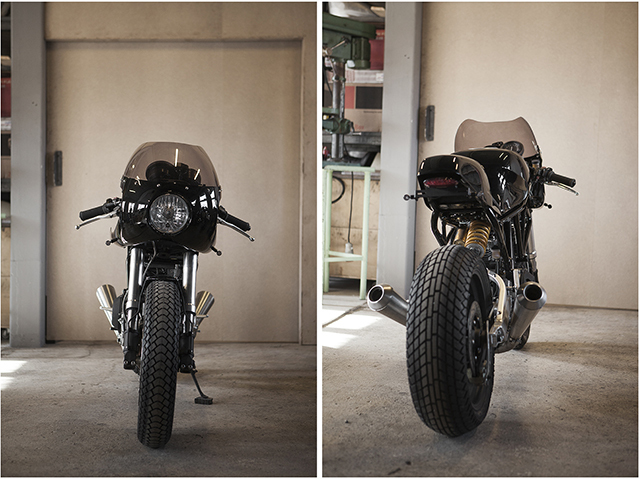 While a one off front fender built by WM and a Ducati 900 SS 1995 tank further simplify the overall appearance. 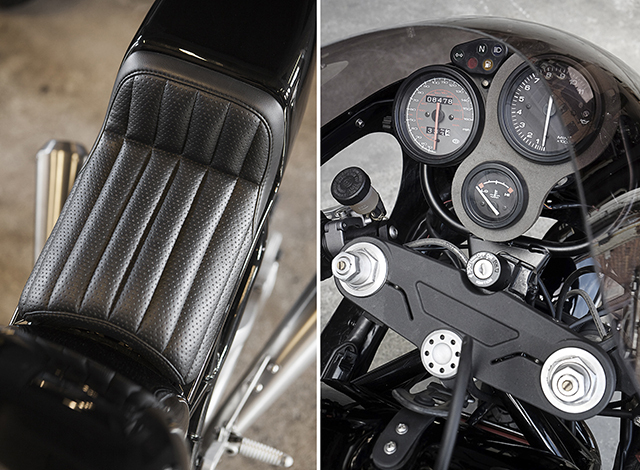 Completing the retro tech look are an off the shelf WM seat cowl that can be adapted to a vast array of models and finished with a beautifully stitched custom seat. The look is completed with an elegant and purposeful WM custom paintjob that leaves the mechanicals on full display. 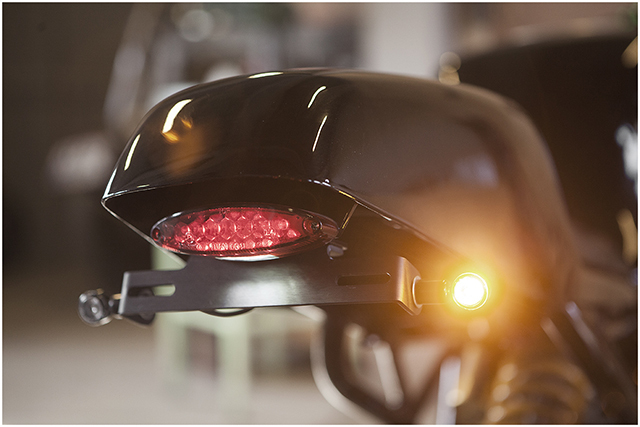 Lighting is a mix of old and new, a classic look 5 3/4″ headlight pokes through the fairing, while LED rear light, LED turn signals and a Motogadget turn relay further enhance the understated look. The LED additions required a partial rewire of the Duke, while an Odyssey battery ensures she fires to life first press of the button, classic looks don’t mandate a heavy kick! 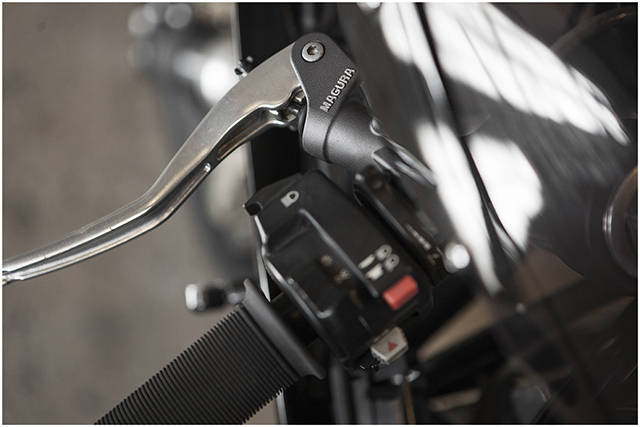 Quality TRW clip-on´s feature Biltwell Kung-Fu grips and hold in place Magura 195 brake and clutch master cylinders that feed steel braided hoses. 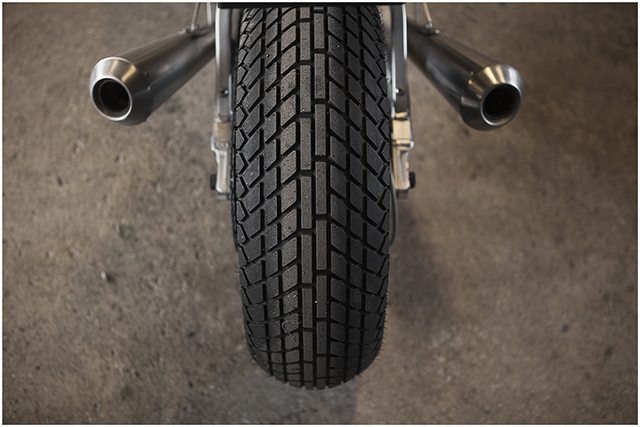 Marchesini wheels are the perfect addition to any Ducati build but they are almost lost when faced with the visual smack in the face that is the Avon Rain Extreme tyres. The result is beautifully crafted 70’s inspired build with an urban warrior practicality that begs to be thrown around the back streets. 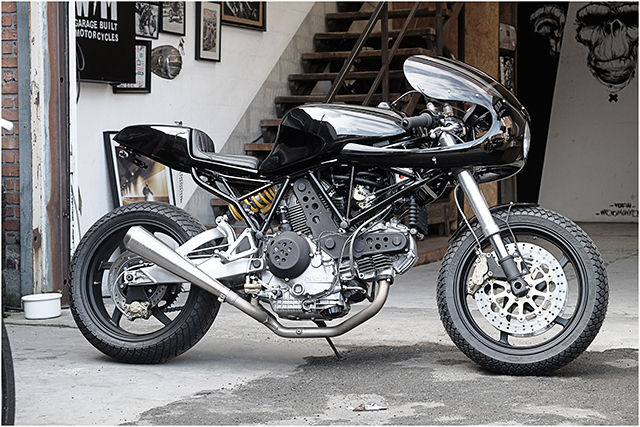 And you could do exactly that, with its Öhlins, Brembo, Marchesini and Avon equipped quality this Wrench Monkees Ducati masterpiece is for sale, contact them now to find out how build #74 could be parked in your garage!